1. In a small saucepan, combine split peas and water or broth. Bring to a boil. Reduce heat and simmer until just tender but still holding their shape, 20 minutes. Drain if needed. Set aside to cool. 2. 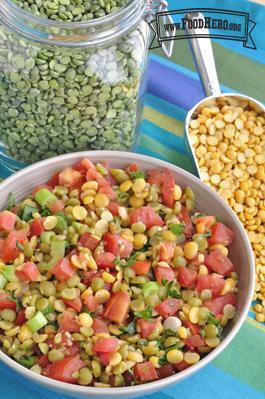 In a bowl, combine the cooked split peas, onion, tomatoes and parsley. Add the dressing and toss lightly.